Costa Rican war stories are not very common. It’s even more unique to hear about national heroes who had a role to play in a civil war that determined the Costa Rican identity. After all, one of the great things about Costa Rica, is that they abolished their army in 1948. However, before that happened, tiny Costa Rica was forced to fight to preserve its independence. In 1855, a North American by the name of William Walker threatened to annex all of Central America for the Southern Confederacy. As one of history’s filibusters, Walker had managed to control the Nicaraguan government by 1855 and proclaimed himself “President.” His next conquest was going to be Costa Rica. While William Walker had the ambition to usurp the whole of Latin America, Juan Santamaria and a civil army of local farmers had other ideas. Walker accomplished setting up dominion in Nicaragua and was moving to Costa Rica. Then stopped by Juan Santamaria in this epic event. The President of Costa Rica at the time, Juan Rafael Mora, brought together a makeshift army of peasants to fight the much more heavily armed enemy. Walker and his army invaded the Guanacaste province. The Costa Rican army the expelled and followed them into Rivas, Nicaragua. It is here that the enemy made their big mistake; Walker and his army took protection in a wooden fort. It was the young Juan Santamaria who bravely volunteered to burn down the fort. This forced Walter and his army out of hiding, resulting in his death and maintaining the independence of Costa Rica. Now, April 11th is a Costa Rican National Holiday in memory of Walker’s defeat in Rivas. The International Airport, in which many arrive in Costa Rica, is aptly named “Juan Santamaria International Airport.” Although you may think the airport is the capital city of San Jose, it is technically in the town of Alajuela. The Alajuelenses (name of people from Alajuela) are very proud of that fact that Santamaria was born in Alajuela. There’s an excellent museum in the center of the town dedicated to this national hero with a nearby statue showing young Santamaria leading his comrades with a torch in hand. The Santamaria International Airport now accommodates cheap flights to Costa Rican destinations as well catch flights with international airlines. Every year on April 11th, Costa Ricans celebrate Juan Santamaria Day to remember their victorious Battle of Rivas and commemorate Juan Santamaria’s death. Alajuela holds a lively parade and people visit Juan Santamaria’s statue in the Alajuela Central Park. Most businesses throughout the Costa Rica are also closed and you’ll hear fireworks all over the country. 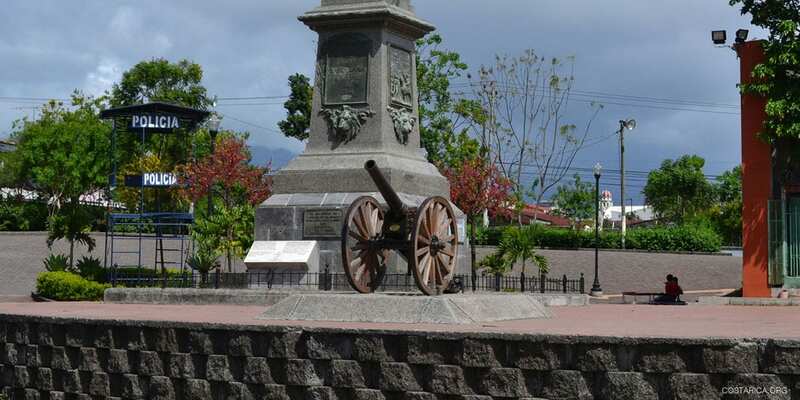 If you want to learn more about Juan Santamaria and the Battle of Rivas, you can visit the museum named after Costa Rica’s national hero in Alajuela. The museum is located right next to the central park, close to the Cathedral of Alajuela. This highly interactive is free and suitable for all ages. It houses exhibits highlighting the history of the Filibuster Campaign of 1856 and Santamaria’s role in stopping William Walker and his army. One of the permanent exhibitions ins entitled the “Caminos de Libertad,” or Streets of Liberty, where the nationally-defining war of 1856 is introduced in several exhibition halls. In highlighting some other defining moments in Costa Rica history, The “Imprenta de Sibaja” introduces Costa Rica’s printing history. It is brought to life with locally-sourced vintage printing press equipment that was owned by the Sibaja printing family. Next to the permanent exhibitions, The Juan Santamaría Museum offers rotating national as well as international cultural exhibitions. There is also a lecture space with a stage that accommodates regularly scheduled offerings of theater, dance, and musical performances. This makes the museum a cultural oasis for all types of artistic expression. An Anthem to Juan Santamaria was composed in 1891 by Costa Rica natives Pedro Calderón Navarro and Emilio Pacheco Cooper! It was sung for the first time during the Juan Santamaria Statue inauguration on the 15 of September of 1891. You can listen to the Anthem on our right here! entonan gozosas un himno triunfal. vuela por la patria, sonriendo, a morir. si siente en el pecho las iras de un dios? se escucha el incendio rugir vengador. This now famous battle wasn’t the only hinderance Costa Rica would face in light of its newly gained independence. in fact, even the path towards full Independence was not a straight one. Learn more about Costa Rica’s Independence and Costa Rica’s history!